643 is a distinctive, organic-shaped, vessel sink designed to sit on the countertop and be appreciated for its unique styling. It makes its presence known with glistening 1/2 thick, tempered glass; ensuring strength, stability and low vulnerability to damage from high temperatures. Its non-porous, polished surface is extremely attractive and sanitary - naturally resistant to stains, odors, and discoloration. 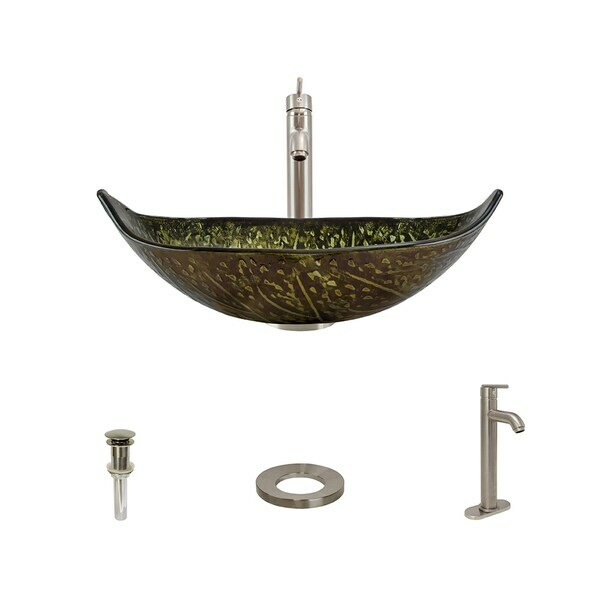 The 643 features a leaf-shaped bowl with embossed veins and embedded green and brown foils running throughout. Its interior is predominantly green and smooth; while its exterior is generally brown and textured. With an overall measurement of 643, it will require a minimum-width cabinet of 24. The vessel faucet features fully-tested, superior-quality, solid-brass components, and ceramic disc cartridges to assure long-term dependable operation. The faucet is constructed without lead and is compliant with NSF (National Sanitation Foundation) standards, the Safe Drinking Water Act, the cUPC (Uniform Plumbing Code of the United States and Canada), the ADA (American Disabilities Act) and carries the EPAs WaterSense label. The included sink ring stabilizes the curved bowl above the counter and coordinates with the brushed nickel finish of the other fixture's. Additionally, a spring-loaded, vessel pop-up drain (vpud) is included, which opens and closes with a simple press to its attractive brushed nickel cap.